At-a-glance survey of the entire Bible, individually summarizing each book and addressing the "who, what, where, when and why" questions. Includes Outlines, Charts, and Timelines. 416 pages, from Thomas Nelson. 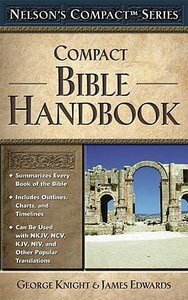 About "Nelson's Compact Bible Handbook"
At-a-glance survey of every book of the Bible addressing the "who, what, where, when and why" questions. George W. Knight (Th.D. Free University of Amsterdam) is adjunct-professor of New Testament at Greenville Presbyterian Theological Seminary's Charlotte Extension, a longtime writer and scholar who has overseen and contributed to many major Bible reference works including the HCSB, Simplified Harmony of the Gospels; The Pastoral Epistles: A Commentary on the Greek Text (New Internation Commentary of the Greek New Testament); The Faithful Sayings in the Pastoral Epistles and The Role Relationship of Men and Women..
James R. Edwards (Ph.D., Fuller Theological Seminary) is an award winning Bruner-Welch Professor of Theology, and Department Chair at Whitworth University, Spokane, WA. He is an ordained minister, PCUSA, contributing editor of Christianity Today, and the author of the award winning Is Jesus the Only Savior? and The Gospel of Mark (Pillar Bible Commentary); Romans (New International Bible Commentary) The Divine Intruder and most recently The Hebrew Gospel and the Development of the Synoptic Tradition.